The primary strings should be closest to the saddle - not the octaves? Looks like you're missing some bling! What a cool guitar...didn't know there was a slope 12 fret D 45, much less a 12 string. I wouldn't kick a six string version out of bed for eating crackers. Cosmetic issues aside, the high E strings (high D strings in this case) are strung on the wrong post (should be swapped). I was lucky I didn’t break a string before I noticed. Not sure I would have noticed that. Good eye. Thinking out loud, do you think it makes a huge difference or adds to the stress? Very nice, what year is it? 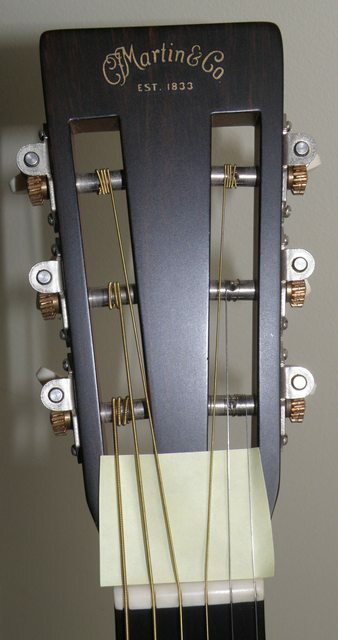 ...the high E strings (high D strings in this case) are strung on the wrong post (should be swapped). Well, all strings are strung strange, sometimes wound towards the inside, sometimes towards the outside and very loose only. I wind mine so they run as straight as possible to the nut slot without touching any headstock wood. 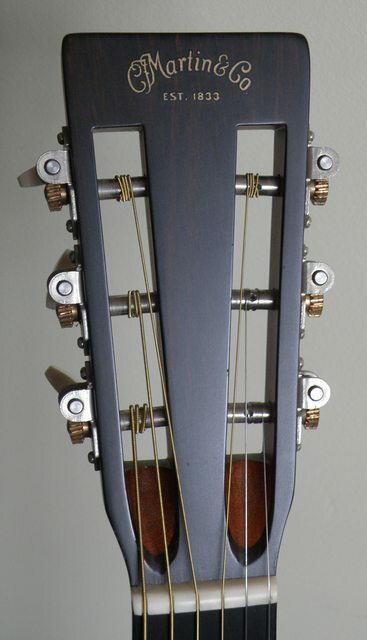 The difference is that when you tune the strings from top to bottom you have to remember that the last tuner tunes the second to last string, and vice-versa. I doubt the stringing error will add any stress to the guitar, but the odds of a string break are probably greater.